Moristar asked how to use an external libray from within a c# flash project. The short answer is yes you can, but you’d have to define stubs. In .net when you are talking to COM an interop assembly is used. The interop assembly defines types which represent the actual types to be used. That assembly is generated automatically at the time you reference the COM assembly. It would be nice to be able to simply add a reference to a SWC file and use the features it defines, but currently it is not supported. A tool could be created which would read the SWC file and create the stub library. Currently this needs to be done manually. A year ago I did exactly this to get to use Google Maps with jsc. Today I updated its source to the latest Google Maps API version. In this post I am going to do this to demonstrate the same techniques for Flint and also comment on what I am doing. I have added a new tutorial for those of you who would like to extend existing ASP.NET web sites with jsc compiler. Read the tutorial over here. Update: This tutorial is now a part of the google jsc site. Added two Java project templates. 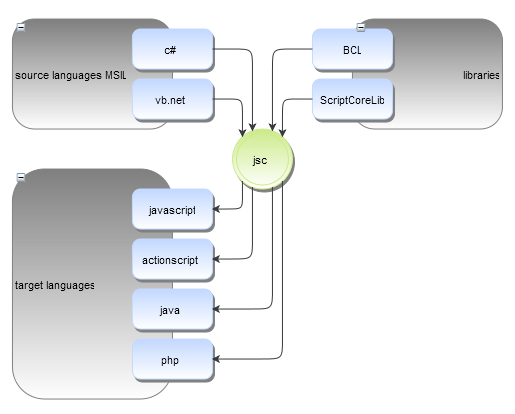 OrcasNativeJavaConsoleApplication – C# to Java as Console Application with JNI bindings. Some updates to the compiler and the framework: Download jsc here. 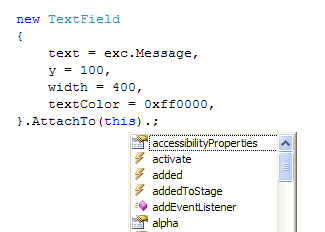 Most important update was fixing the virtual + override semantics for jsc:actionscript. It’ did not allow to combine multiple events for example. Some minor updates to the compiler and the framework: Download jsc here. Previous releases contained a serious bug when jsc was being used on a machine without the DIA SDK. It comes with the Visual Studio retail version and I did not realized it before. Now jsc wont crash when the DIA SDK is not installed and method variable names will be autogenerated instead of beeing looked up in the pdb file.